Roll with WA Bikes to support statewide bike policy and advocacy in the #1 Bicycle Friendly State in America (every year since 2008). 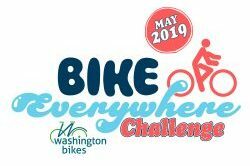 SIGN UP FOR THE 2019 BIKE EVERYWHERE CHALLENGE DURING BIKE MONTH IN MAY! If you’d like to support the non tax-deductible work of Washington Bikes, click donate below. The Bike Everywhere Month Challenge begins May 1st! Sign up to stay informed about bike news in Washington state.